Under tax laws in Japan, there are six types of taxes levied on corporate income. Corporate tax and local corporate tax are imposed on taxable income of a company. Corporate inhabitant taxes are levied on both income and a per capita basis using the company’s capital and the number of its employees as the tax base. 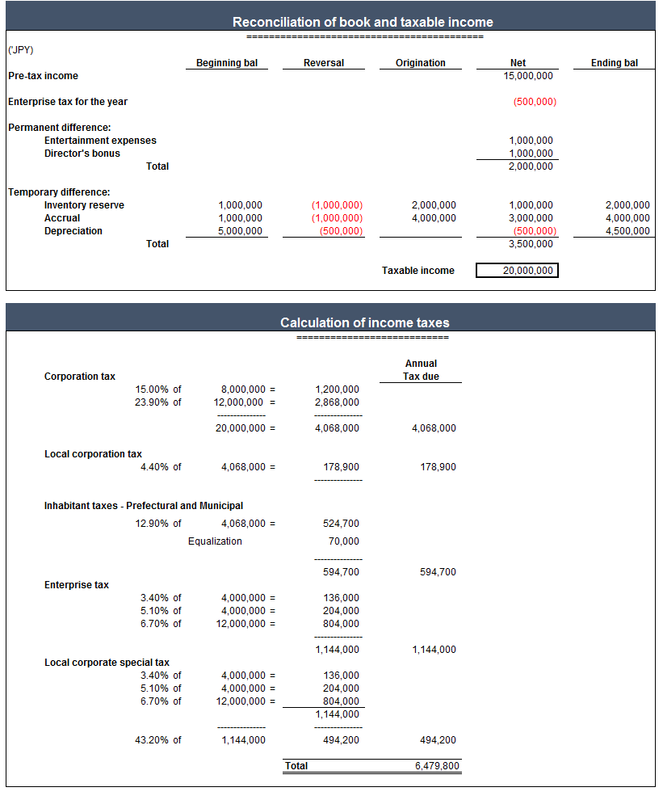 Enterprise tax and special local corporate tax are taxed based on corporate tax amount of a company, however, corporations with paid-in capital of more than 100 million Japanese yen are also subject to size-based tax. Note that the rates for local taxes may vary depending on the size of the business and the place where a company is located. Due to the nature of taxes, corporate tax and inhabitant taxes are not recognized as expense in the tax calculation. However, Enterprise tax and special local corporate tax are allowed to be expensed in the tax calculation when they are actually paid. Below is a summary of typical temporary and permanent difference items that should be adjusted in the tax return. Similar to the United States, laws allow companies to maintain two separate sets of books for financial and tax purposes. Because the rules that govern financial and tax accounting differ, temporary differences arise between the two sets of books. This can result in deferred tax asset. However, under tax laws in Japan, only expenses recorded in the financial statement can be deducted in the tax returns. Thus, deferred tax liability will not exist when there are differences between tax and financial accounting in depreciating fixed assets. One of things that make the calculation of effective tax rate complicated is that the enterprise tax (including special local corporate tax) can be deductible from its taxable income when it is paid. 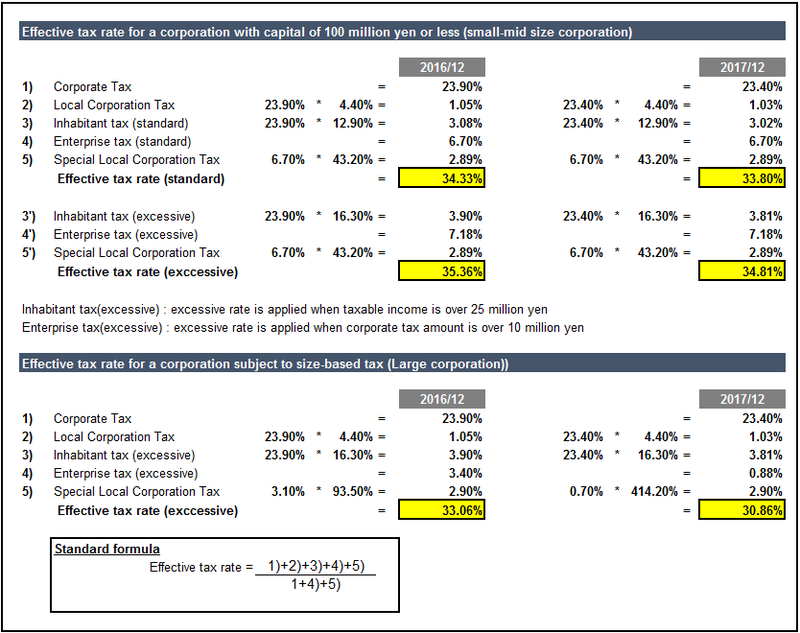 Below is the standard formula in calculating the effective tax rate here in Japan. Corporations are required to file a final tax return for corporate tax, corporate inhabitant tax and enterprise tax on their income within two months after the end of its fiscal year. Note that an extension of 1 month for filing a final tax return is allowed when a corporation gets approval from the taxation office under a situation where a company cannot file a final tax return due to accounting audit work. The final tax payment to the tax office must be made within two months after the fiscal year end regardless of whether a filing extension is approved. When the amount of corporate tax for the first six months of the fiscal year is over 100 thousand yen, based on the amount of tax in the previous year, interim tax return is required. Filing and payment for the interim tax return have to be completed within two months from the end of the first six months. When a tax loss arises in a given year, that loss can be carried forward to offset with the profits of the future year if the company has blue-form tax return filing status. Net losses incurred in each fiscal year ending on or after April 1, 2008 can be carried forward for the following nine years. Under 2016 tax reform, NOL incurred in each fiscal year starting on or after April 1, 2018 can be carried forward for the following ten years. (*1) If a company has capital in excess of 100 million Japanese yen or is a wholly owned subsidiary of a large corporation with capital of more than 500 million Japanese yen, the company is treated as large corporation under corporate tax. Although a corporation cannot receive a refund in principle, certain corporations, such as small and medium-sized companies meeting certain criteria, are allowed to carry back a loss to the business year beginning not more than one year prior to the date of commencement of the fiscal year in which the loss incurred, and receive a refund of the amount of corporate tax in the fiscal year in which the loss was carried back.